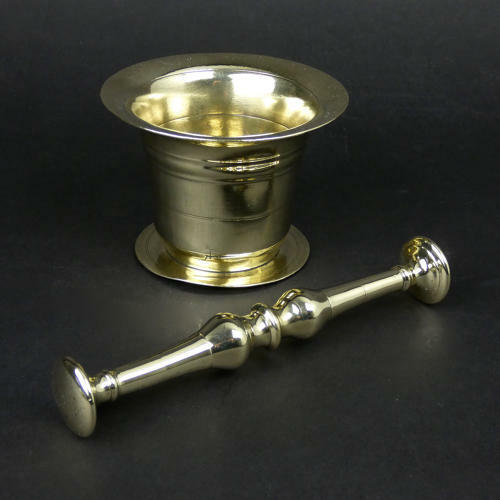 A nineteenth century, brass mortar and pestle. This is quite a small example, ideal for grinding spices. It is cast on brass and it is fairly simple in form, dating from c.1860. The mortar has taken a bump at some time and the rim is bent upwards slightly on one side. It does, however, still sit flat. The mortar is 8.8cm. high by 11.8cm diameter and the pestle is 19cm. long. Price includes postage within the U.K. Shipping to the U.S.A. add £28. Western Europe add £10.